We don't often hear about the Orthodox Christian Tradition, that eastern branch of the Christian faith that to some is exotic and even attractive as a spiritual tradition, but probably not as a public voice. Martin Marty has chosen to take notice of a journal titled Public Orthodoxy, which seeks to bring the broad Orthodox tradition into the public conversation. Since Orthodox Christianity has lived in recent centuries in the shadow of the Ottoman Empire and the Islamic world, as well as in the Shadow of the Soviet system for much of the 20th Century, it is worth attending to. Thus, I invite you to read and converse! When a message from Public Orthodoxy reaches us, we read it and resolve to do better at sighting Eastern Orthodoxy for this e-column. The subtitle of Public Orthodoxy is “Bridging the Ecclesial, the Academic and the Political,” which points to three zones of interest to us and, presumably, to our readers. Other headlines may look forbidding to those of us imprisoned in or at least limited by the worlds of Western Christianity and “the West” in general. The non-Eastern-Orthodox may need help with “Political Nestorianism and the Politics of Theosis” or “Don’t Confuse Autocephaly with Theology,” articles by Aristotle Papanikolaou and George Demacopoulos respectively. These two scholars are the co-founders of Fordham University’s Orthodox Christian Studies Center, designed to encourage inquiry into the public face of Eastern Orthodoxy and to help make it better known. The Center and Public Orthodoxy do this well, while explaining terms that may appear to be forbidding or obscure. Most of the media-fronts cover Roman Catholicism, Protestantism in its many varieties (including Fundamentalism, Evangelicalism, and Pentecostalism) as well as Judaism and Islam, etc. One or another or all of these daily make headlines or reach primetime broadcasts and the worlds of Facebook and Twitter. Eastern Orthodoxy now and then does make appearances, usually accompanied by pictures of be-robed, bearded clerics going about “Ecclesial” business, not so much that of the “Academic” and the “Political” or cultural. Why pay attention to Eastern Orthodoxy in public life? We pay attention for intrinsic reasons: it is one of the largest Christian communions, complex because of and coping with “autocephaly” which complicates ancient ways of organizing the Church. We pay attention because it is the Christian front, which through the centuries has been fatefully conjoined with that of the Ottoman Empire and today’s Islamic world, which the West is tardily and painfully trying to understand. We pay attention because when Russia was Sovietized, it was the Russian Orthodox Church which suffered most and now, in post-Soviet days, deals with a newly problematic Russian government and sphere. We pay attention, as one of the headlines mentioned above suggests, because it has its own occasions for engaging in Jewish-Christian dialogue. We pay attention, further, because of its rich culture, liturgy, devotion, and saintly expressions. We pay attention because of theological discourse, which is increasingly influential in the West: “Theosis? Look it up; if it’s new to you; millions of Christians conceive of their humanity differently because of the “God in them” (through Christ). The media has too often and too long overlooked Eastern Orthodoxy. We suggest that readers pursue some of the links listed below, or sign up to receive Public Orthodoxy posts since its never too late for Christians, Jews, Muslims, “Nones” and others to do their own sighting and reckoning. To subscribe to Public Orthodoxy, a publication of the Orthodox Christian Studies Center of Fordham University, visit: http://publicorthodoxy.org. Bordeianu, Radu. “The 2016 Pan-Orthodox Council and Ecumenical Relations.” Public Orthodoxy, posted October 30, 2015. This essay was originally delivered as a public talk at the June 2015 Fordham University/Orthodox Theological Seminary in American (OTSA) conference; it was part of a panel on ecumenical relations.http://publicorthodoxy.org/2015/10/30/the-2016-pan-orthodox-council-and-ecumenical-relations/. Azar, Michael G. “Jewish-Christian Relations and Orthodox Ecumenical Participation.”Public Orthodoxy, posted October 22, 2015. This essay was originally delivered as a public talk at the June 2015 Fordham/OTSA conference; it was part of a panel on ecumenical relations. http://publicorthodoxy.org/2015/10/22/jewish-christian-relations-and-orthodox-ecumenical-participation/. Woloschak, Gayle E. “Religion and Science as a Pastoral Issue.” Public Orthodoxy, posted October 8, 2015. This essay was originally delivered as a public talk at the June 2015 Fordham/OTSA conference; it was part of a panel on “The Contribution of the Orthodox Church to the Realization of Justice, Freedom, Brotherhood, and Love among Peoples.” http://publicorthodoxy.org/2015/10/08/religion-and-science-as-a-pastoral-issue/. Papanikolaou, Aristotle. “Political Nestorianism and the Politics of Theosis.” Public Orthodoxy, posted October 12, 2015. This essay was originally delivered as a public talk at the June 2015 Fordham/OTSA conference; it was part of a panel on “The Contribution of the Orthodox Church to the Realization of Justice, Freedom, Brotherhood, and Love among Peoples.”http://publicorthodoxy.org/2015/10/12/political-nestorianism-and-the-politics-of-theosis/. Demacopoulos, George. “Don’t Confuse Autocephaly With Theology.” Public Theology, posted September 25, 2015. This essay was original delivered as a public talk at the June 2015 Fordham/OTSA conference; it was part of a panel on Autocephaly and Diaspora. http://publicorthodoxy.org/2015/09/25/dont-confuse-autocephaly-with-theology/. Rich, Bryce. “Strange Bedfellows Scapegoat Russia’s Gays.” Sightings, September 26, 2013. https://divinity.uchicago.edu/sightings/strange-bedfellows-scapegoat-russias-gays-bryce-e-rich. Toly, Noah. “Reports Analyzing Issues Around the World Oddly Silent on Religion.”Sightings, March 6, 2014. https://divinity.uchicago.edu/sightings/reports-analyzing-issues-around-world-oddly-silent-religion-—-noah-toly. Marty, Martin E. “Russian Orthodoxy.” Sightings, July 21, 2014.https://divinity.uchicago.edu/sightings/russian-orthodoxy-—-martin-e-marty. 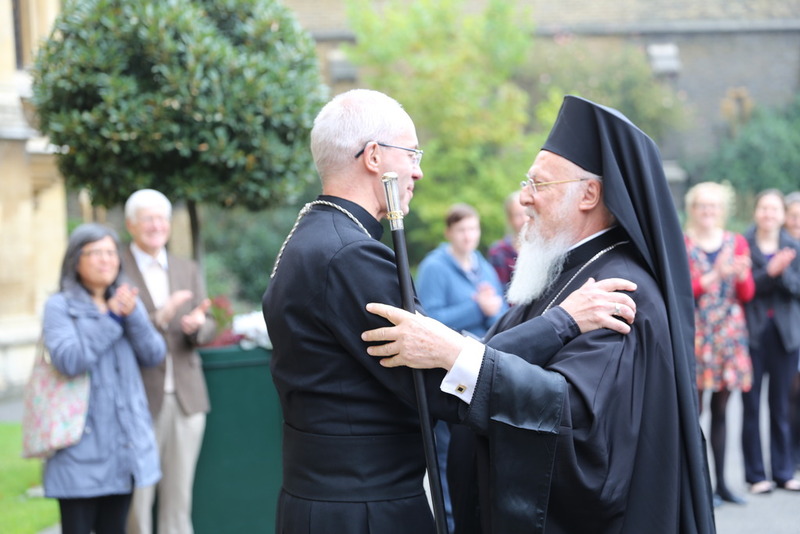 Image: On November 2-4, 2015, His All-Holiness Ecumenical Patriarch Bartholomew visited the Archbishop of Canterbury, Justin Welby, at Lambeth Palace, England, to discuss the climate crisis ahead of the 2015 U.N. Climate Change Conference; Credit: Lambeth Palace.